Welcome to Ship My Car! Welcome to ShipMyCar.info, the best place on the web for free car shipping information and quotes! With over two decades of industry experience, Ship My Car has helped facilitate auto relocations throughout America. Among the vehicles we ship include cars, boats, trucks, vans, buses, RVs, motorcycles, ATVs and just about any other type of vehicle you can think of. We provide trusted car shipping services and information and always go the extra mile to make sure that our customers receive the best service possible at a cost that doesn’t break the bank. Fill out the short quote form to see how much we can save you on auto shipping today! 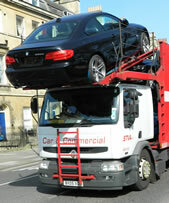 Before choosing an auto shipping company, there are some important considerations that should be taken into account. This checklist will help you take into account the different factors that come into play when transporting a car or truck. Price is always an important part of the decision making process when hiring a company of any kind and auto transport is no different. The cost of shipping a car can vary substantially depending on the distance, time frame and type of method of transport. Planning ahead, being flexible and understanding your options can save your considerable money. There are two main decision you need to make when shipping a car or truck: enclosed v. open container and terminal or door deliver. Enclosed container shipping is provides more security, while open container is more cost effective. Terminal shipping means you have to pick up your vehicle, and door-to-door delivers directly to the destination. Most car shipping companies will offer a free quote by simply filling out a short online form, similar to the one at the top of this page. For the most part, these quotes are free, no- obligation estimates of the cost of transporting your vehicle. Armed with several estimates from different companies, you are in a much position to find the service you need at a price that fits your budget. Before requesting an estimate from an auto shipper, it’s important to have all the information they will need. At the very least, you should have a date range, location and destination. You should also mention any quirks to starting or driving your vehicle. What types of vehicles can be transported? Virtually any type of vehicle can be transported. Some of the more common vehicles that we ship included cars, trucks, motorcycles, boats and RV’s. Many of our customers include people buying or selling classic, exotic and high-end vehicles that require interstate or cross country auto transport services. By following these steps, you protect yourself from incurring any additional costs or delay in the delivery of your vehicle.